Adenomyosis is defined as ectopic endometrial tissue within the musculature of the uterus.1 It is a challenging condition in that it often overlaps in symptoms and is found in conjunction with other gynecologic disorders, including endometriosis and uterine leiomyoma (fibroids).2 The typical clinical manifestations of adenomyosis occur in women who are 40 to 50 years of age and include abnormal uterine bleeding and dysmenorrhea (65% of patients).1 The exact pathogenesis is not fully defined but is thought to be the result of direct invagination of the endometrium into the myometrium.3 The interventionalist’s role is to offer uterine artery embolization (UAE), which provides some benefits over traditional medical and surgical therapies for adenomyosis. Figure 1. Preembolization T2-weighted MRI showing a diffusely thickened junctional zone with several high-signal foci consistent with diffuse adenomyosis. Small scattered fibroids are also seen. The question then becomes what, if any, benefit is there to performing an MRI? Typical findings of adenomyosis on MRI include thickening of the junctional zone exceeding 12 mm and high-signal-intensity foci on T2/T1-weighted images similar to the case shown in Figure 1.4 Many studies have evaluated the diagnostic accuracy of TVUS and MRI techniques for adenomyosis. 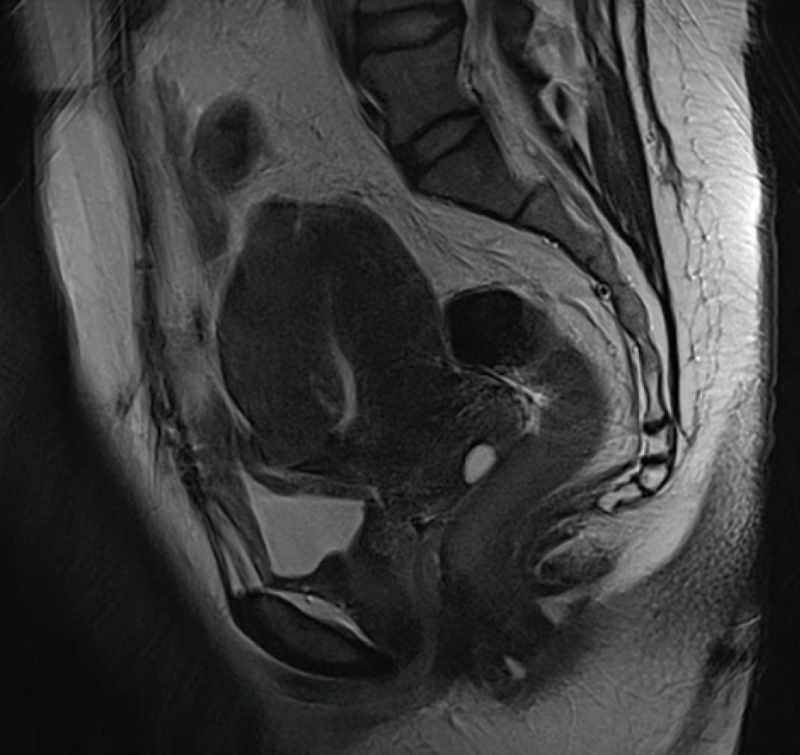 TVUS has a sensitivity of approximately 72% and specificity of 81% versus 77% and 89% for MRI, respectively.8 In addition, MRI can provide greater detail about the extent of disease and additional uterine lesions, as well as information about the less common presentation of adenomyosis, where focal disease in the form of an adenomyoma is present rather than the more typical diffuse adenomyosis findings. For reproductive-age women and those with focal adenomyoma, conservative surgical approaches may be a better option. A recent systematic review of excisional and nonexcisional surgical approaches, including adenomyomectomy with or without myometrial reduction, endomyometrial ablation or resection, electrocoagulation of adenomyoma, and myometrial excision, found that more than 75% of women experienced symptom relief with these conservative surgical treatments.10 However, recurrence rates varied from 9% to 32%, depending on the technique. When considering UAE for the treatment of adenomyosis, all patients at our institution have a preprocedural consultation, which allows for review of the symptomatology, a physical examination, and imaging. The first question that is answered in this setting is, “Does this imaging finding of adenomyosis explain the patient’s symptoms?” If the patient has dysfunctional uterine bleeding such as bleeding between cycles, endometrial biopsy is sometimes recommended to be performed by a gynecologist before considering embolization, based on the American College of Obstetricians and Gynecologists guidelines. Each patient will be asked about their desire for future fertility, and a brief overview of the aforementioned alternative options will be presented when appropriate. Simplified pictures of the pelvis and catheter placement are used during description of the procedure. The outcomes of the procedure and possible risks are also covered. Active untreated infection, pregnancy, and suspected gynecologic malignancy are considered absolute contraindications to UAE, whereas contrast allergy, coagulopathy, desire for future fertility, and renal impairment are relative contraindications.13 Additional risks discussed with the patient include onset of menopause, arterial injury at the puncture site, clot formation, and in the case of concomitant fibroids, missed malignant tumor (leiomyosarcoma), and fibroid passage. Results of laboratory testing, including complete blood count for platelet count, basic metabolic panel for potassium and creatinine, and international normalized ratio, are reviewed or tests are ordered if not available. Patients are then evaluated for their ability to undergo the procedure using moderate sedation. A pregnancy test is performed on the day of the procedure for all women of childbearing age. Patients refrain from eating and drinking 6 hours prior to UAE, and the procedure is performed under moderate sedation with fentanyl and midazolam. A Foley catheter is inserted into the urinary bladder prior to the start of the procedure. Figure 2. Digital subtraction angiogram with microcatheters in the bilateral uterine arteries showing asymmetric filling of the uterus. Figure 3. 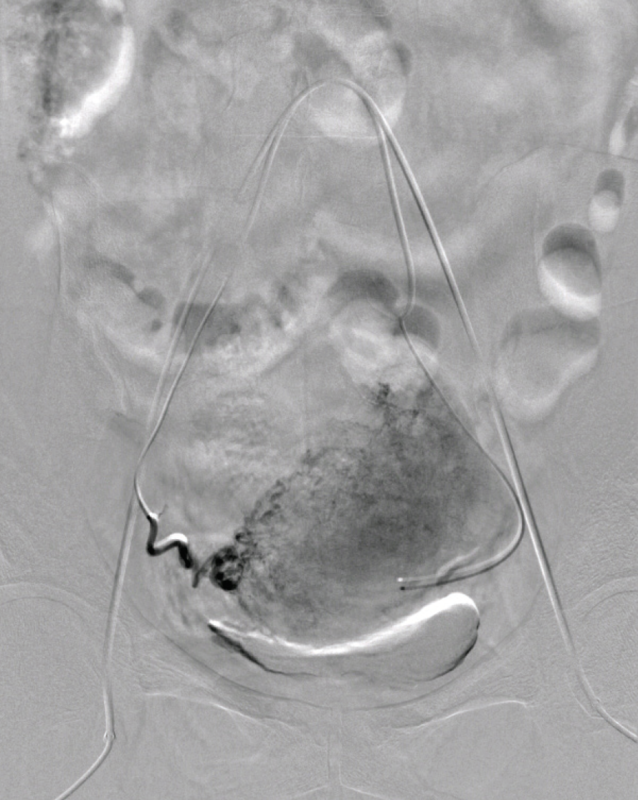 Digital subtraction angiogram of the right ovarian artery showing supply to the right fundal region. Depending on the preference of the interventionalist, unilateral common femoral artery, bilateral common femoral artery (Figure 2), or left transradial access is obtained. The patient is provided prophylactic treatment with ketorolac and an antiemetic. The internal iliac artery is catheterized with a 4- to 5-F catheter. Either a 4- to 5-F catheter or a high-flow microcatheter is used to catheterize and embolize the uterine arteries. Attention is given to begin embolization distal to the origin of the cervicovaginal branches of the uterine artery, if visualized. Aortography may be performed in patients who have previously undergone pelvic surgery, those with a suspected ovarian artery or other collateral (Figure 3), or those with an outside MRI that was performed without the MRA component. At the completion of the procedure, all catheters are removed and hemostasis is achieved with manual compression or with use of an arterial closure device at the discretion of the operator. Embolization of adenomyosis is often associated with greater pain than typically experienced by patients who undergo embolization for fibroids alone, and it is important to have a pain management protocol in place. Patients are immediately provided with a patient-controlled analgesia pump following the procedure. Intravenous ketorolac is given at scheduled intervals to address postembolization inflammation, and patients are admitted for 23-hour observation. More recently, there are proponents for scheduling same-day discharge, particularly for those who undergo the procedure using a radial artery approach or arterial closure device. It is the opinion of the authors that significant pain and nausea control is commonly needed for the first night after UAE for adenomyosis, and this is done most safely within the hospital setting. Further investigation is needed to evaluate newer pain control methods in conjunction with maintaining successful UAE outcomes. Figure 4. 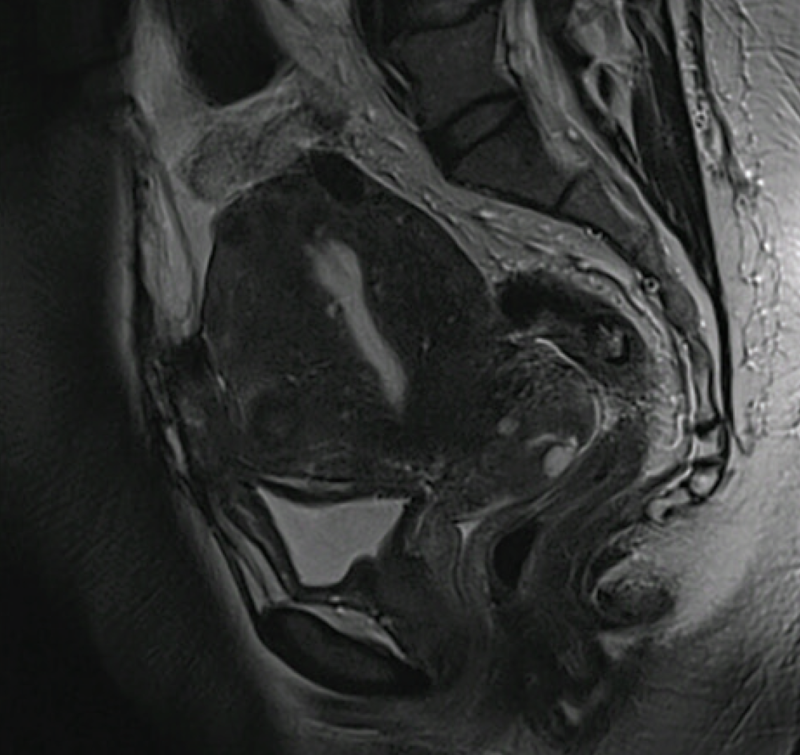 Postembolization T2-weighted MRI showing decreased overall size of the uterus and decreased prominence of the diffuse adenomyosis seen in Figure 1. The morning after the procedure, the patient-controlled analgesia is discontinued and a trial of oral analgesics is presented before the patient is discharged home on scheduled ibuprofen with an oral narcotic for breakthrough pain, if needed. Patients then receive a phone call approximately 48 hours after discharge, and a 3-month clinical follow-up is scheduled. MRI at 3 months is reviewed during the clinic visit for degree of infarction, decrease in uterine size, and any complicating factors (Figure 4). Previous case studies have shown favorable short-term outcomes for symptom relief after UAE for adenomyosis; however, recurrence rates are higher than for the treatment of fibroids.15 Popovic et al revealed 83.8% of pure adenomyosis patients experienced symptom relief with a median follow-up of 9.4 months, but only 64.9% of patients experienced sustained improvement after a median follow-up of 40.6 months.15 Overall uterine volumes decreased by 23% to 32% (including those with combined adenomyosis and fibroids). Complications included amenorrhea (20.9%) and eventual hysterectomy (12.8%). Of note, all amenorrheic patients were older than 45 years. A recent review and meta-analysis showed overall symptom improvement in 83.1% of patients who underwent UAE for adenomyosis.16 Symptom improvement was separated into four groups: short-term pure adenomyosis (89.6%), short-term adenomyosis with fibroids (94.3%), long-term pure adenomyosis (74.0%), and long-term combined adenomyosis (84.5%), and good initial outcomes were found but with less of a sustained response. Percentage of uterine volume reduction was greater and statistically significant in the pure adenomyosis group at 3 months, but results were similar between the groups at 6- and 12-month follow-up. Amenorrhea was reported in 6.3% of all patients, and all of these patients were older than 40 years. The need for hysterectomy varied between groups in the short term, with 2.6% of pure adenomyosis patients and only 1.4% of combined adenomyosis patients undergoing hysterectomy; however, there was no significant difference in these patient groups in the long term (7.2% vs 7%). Patients with adenomyosis often experience abnormal uterine bleeding and dysmenorrhea. A range of treatment options is available depending on the patient’s age and comorbidities, type of adenomyosis, desire for future fertility, and desire to maintain their uterus. UAE presents a useful option for those who wish to avoid hysterectomy and prefer a minimally invasive technique with a short hospital stay. Symptomatology should correlate to characteristic imaging findings on TVUS or MRI, with MRI preferred because it provides additional information about the frequent concomitant pelvic conditions. Pain control in the postprocedure period is an important aspect to consider, and adjunctive techniques such as the use of intra-arterial lidocaine may be useful. UAE offers favorable short-term outcomes for patients with adenomyosis, but further randomized controlled trials are needed to determine if symptom resolution is sustainable and explore the impact on fertility. Although recurrence rates are higher than for fibroids, UAE for adenomyosis offers symptom relief in two-thirds of patients and is uterine sparing. 1. Struble J, Reid S, Bedaiwy MA. Adenomyosis: a clinical review of a challenging gynecologic condition. J Minim Invasive Gynecol. 2016;23:164-185. 2. Ascher SM, Jha RC, Reinhold C. Benign myometrial conditions: leiomyomas and adenomyosis. Top Magn Reson Imaging. 2003;14:281-304. 3. Bergeron C, Amant F, Ferenczy A. Pathology and physiopathology of adenomyosis. Best Pract Res Clin Obstet Gynaecol. 2006;20:511-521. 4. Agostinho L, Cruz R, Osório F, et al. MRI for adenomyosis: a pictorial review [published online October 4, 2017]. Insights Imaging. 5. Hanafi M. Ultrasound diagnosis of adenomyosis, leiomyoma, or combined with histopathological correlation. J Hum Reprod Sci. 2013;6:189-193. 6. Verma SK, Lev0Toaff AS, Baltarowich OH, et al. Adenomyosis: sonohysterography with MRI correlation. AJR Am J Roentgenol. 2009;192:1112-1116. 7. Dueholm M, Lundorf E. Transvaginal ultrasound or MRI for diagnosis of adenomyosis. Curr Opin Obstet Gynecol. 2007;19:505-512. 8. Champaneria R, Abedin P, Daniels J, et al. Ultrasound scan and magnetic resonance imaging for the diagnosis of adenomyosis: systematic review comparing test accuracy. Acta Obstet Gynecol Scand. 2010;89:1374-1384. 9. Radzinsky VE, Khamoshina MB, Nosenko EN, et al. Treatment strategies for pelvic pain associated with adenomyosis. Gynecol Endocrinol. 2016;32(suppl 2):19-22. 10. Younes G, Tulandi T. Conservative surgery for adenomyosis and results: a systematic review [published online July 21, 2017]. J Minim Invasive Gynecol. 11. Pontis A, D’Alterio MN, Pirarba S, et al. Adenomyosis: a systematic review of medical treatment. Gynecol Endocrinol. 2016;32:696-700. 12. Stovall TG, Ling FW, Crawford DA. Hysterectomy for chronic pelvic pain of presumed uterine etiology. Obstet Gynecol. 1990;75:676-679. 13. Keung JJ, Spies JB, Caridi TM. Uterine artery embolization: a review of current concepts [published online September 29, 2017]. Best Pract Res Clin Obstet Gynaecol. 14. Noel-Lamy M, Tan KT, Simons ME, et al. Intraarterial lidocaine for pain control in uterine artery embolization: a prospective, randomized study. J Vasc Interv Radiol. 2017;28:16-22. 15. Popovic M, Puchner S, Berzaczy D, et al. Uterine artery embolization for the treatment of adenomyosis: a review. J Vasc Interv Radiol 2011;22:901-909. 16. de Bruijn AM, Smink M, Lohle, PNM, et al. Uterine artery embolization for the treatment of adenomyosis: a systematic review and meta-analysis [published online October 9, 2017]. J Vasc Interv Radiol. Disclosures: Consultant to Vascular Solutions.